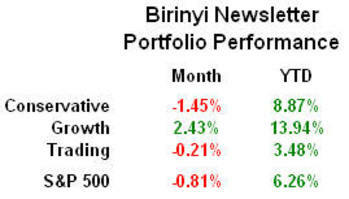 Usually published on the last Wednesday of each month, the newsletter will be available to Birinyi subscribers momentarily. It contains Laszlo Birinyi's personal market commentary and incite, as well as factual information about market events and the sought after Newsletter Portfolios. The last hike in the Fed Funds Target Rate was exactly a year ago today, and there it has remained. 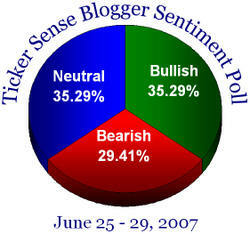 Mixed messages from economic data have pressed analysts estimates both up and down, the current consensus is now for a cut in 2008. 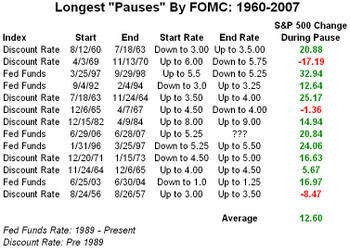 Revisiting an old table we look below at how the market has reacted to long periods of unchanged rates. 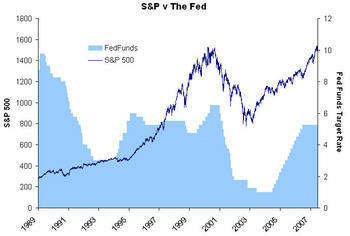 We have also included a chart of the S&P 500 versus the Fed Funds Rate since 1989. 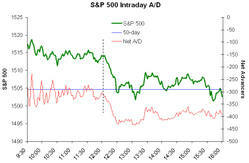 The current period is catching up to the largest gains, far outpacing the the average gain of 12%, but significantly shorter than the longest period of 1070 calendar days. 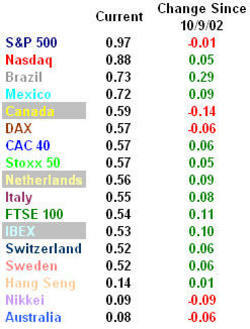 Below we feature selected international equity indices with their current and estimated P/E ratios. 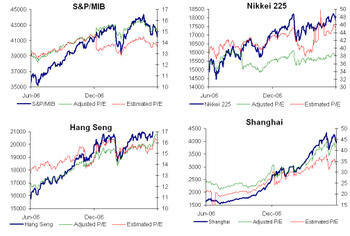 The US and Japanese stocks have had the most stable P/Es over the last year, while other world equities have had increasing P/E ratios over the same time period. Why is it that we only hear about the Vix when the market is correcting? Recently it has been associated it with tragedy and horror because during last year's rally it reached historic lows; the market quietly went up while the Vix quietly went down. When the market is going up and the Vix is going down, everything is hunky dory. Profits are made and confidence is high. Below we look at the Vix index versus the point spread between the daily high and low prices in the S&P 500. 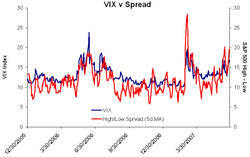 As we would expect, when the market is volatile is shows up as an increase in the Vix and our High/Low spread. The point: OPPORTUNITY. If there is a larger difference between the highs and lows in the market then there are more intra day trading opportunities. These large swings also give old money a chance to get out of stocks and allow new money in. Not everyone is able to track the market all day long and make profits off of intra day changes, but it is not always so bad when things get shaken up. The table below illustrates what the S&P 500 has done since 1990 after the Vix index reaches six month highs or lows. A six month high for the Vix has indicated a good buying opportunity as the market has rallied 3% over the following six months. Conversely, a low for the Vix is a bearish sign and we see that the market is down on average for the following periods. This week there are still more bulls than bears! Birinyi Interactive ETF Ratings! ETFs are rated on a variety of categories, including: technical trends, investor sentiment and large holders, relative strength versus peers, and how well they track their respective index. Birinyi Associates, Inc. has developed a unique scoring system to rate over 350 equity based ETFs. We track each ETF since its inception and measure its daily performance against the index it is based off of. We also measure performance over the month and calculate correlation coefficients for each fund. 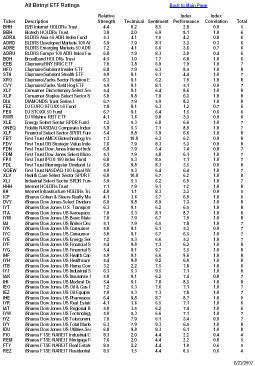 ETFs are then ranked based on a total score. Stay tuned for more samples, or contact Birinyi Associates for information on our premium services. Hope is on the horizon. Today was the first Friday since April 27, 2007 that the market has closed down. There have been 7 Friday closes since then, not including today or the 27th. In the current bull market the S&P 500 has closed down on Friday 112 out of 238 possible occurences, or 47% of the time. On average the market returns 15bps on the Monday after a weak Friday, and 37bps the following week. More and more we are beginning to see the market move as a unit. Instead of some stocks up and some down, on these big market days ALL stocks are down. Today 29 of the 30 Dow stocks were down, most over 1 percent. 447 of the S&P 500 members closed down. We thought it would be interesting to take a look at how many stocks were up versus down over the course of the day. 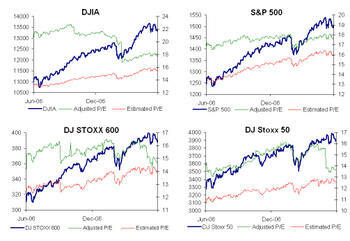 The chart below shows how many stocks were down at different times during the day. In this type of environment it is harder for individual investors to make good stock picks. Even if you have selected the perfect company with great potential for growth it may not be safe from broad moves like today's. 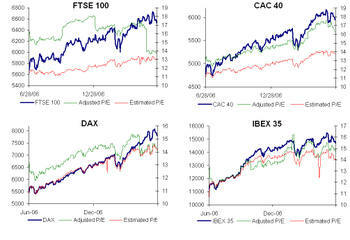 Below we show the one year correlation of selected global equity indices with the Dow Jones Industrial Average, and how it has changed over the past ten years. 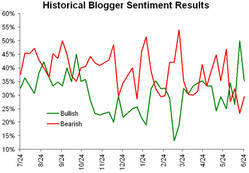 Figures for the chart are calculated in the same way as a moving average, think of it as moving correlation. If the illustration is too busy or confusing, the table highlights the current correlation as it appears at the end of the chart. With the current correlation figures we also include the change in correlation since the bull market in US stocks began. As we would expect, the S&P 500 is, and has been, most correlated to the Dow over the entire period. Most recently Mexico and Brazil have undergone the largest increase in correlation, while the Asian markets remain largely uncorrelated to the US. The above table and figures are one year correlation numbers. 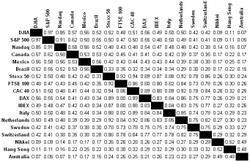 Shown below is a matrix of the same world indices and how they are correlated to one-another. 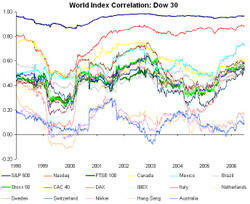 The correlation numbers shown in the matrix are since 3/3/03, the beginning of the bull market in the MSCI World Index. At it's current price of $39.20, General Electric is up $1.13 on the day and has pushed the S&P 500 up a whopping 1.31 points. It is by far the largest index mover today, BAC is second and has moved the index 0.31 points. Today more than half of the S&P 500 stocks are DOWN, but GE's strength has kept the market relatively flat. 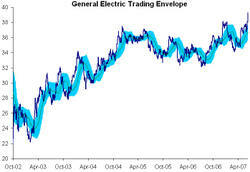 Below we highlight General Electric throughout the current bull market, and how it has moved through its trading envelope. We noticed that typically after large moves GE trades sideways back into its trading range and in many case will fall below its 50-day moving average before eventually going higher.